Made It Through Mum: Philippine Marketing Association - 47th National Marketing Conference says "Hello ASEAN"
Philippine Marketing Association - 47th National Marketing Conference says "Hello ASEAN"
The ASEAN market is overflowing with untapped opportunities for Chief Operating Officers and Chief Marketing Officers and their teams to make a distinctive entry into this emerging economic powerhouse within the Asian Region. 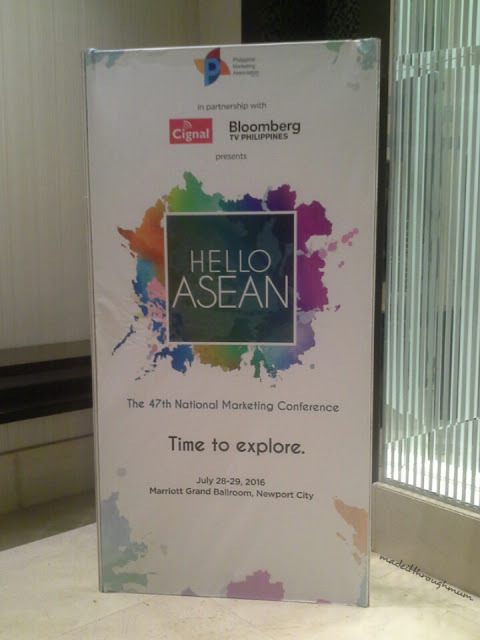 Last May 20 at Marriott Grand Ballroom in Newport City, Philippine Marketing Association (PMA) held a press conference to give a background and knowledge of what will happen and topics to be dicussed on July 28-29, 2016 as they celebrate their 47th National Marketing Conference with its theme "Hello ASEAN". The conference will feature stories and scenarios from top-tier business experts and practitioners, marketing masters and disrupters, including CEOs of the Philippines, Asian, and global brands that successfully launched or grown their businesses in the ASEAN trade sphere. The speakers will share their success stories and learnings from exploring and filling the gaps in the market. These insights will feature the strategies and tool that helped their companies conquer multiple challenges. Aside from the invaluable content that attendees will get from the conference and an accompanying trade exhibit, " Hello ASEAN " will feature the ASEAN Pavilion that houses the embassy representations from ASEAN member nations and other guest Asian countries. "This will give our attendees opportunities to explore, on more concrete grounds, possible partnerships. These business meet-ups are fertile ground for networking , exchanges, developments and partnerships, " PMA President Ms. Pinky Yee shared. PMA also teamed up with the No.1 Business channel, Bloomberg, which recently opened its Philippine office after establishing partnership with TV5 Network Inc. and Cignal. Being the first business news channel to air on a 24/7 basis in the country, Bloomberg TV Philippines is now set to reach out to its audience by co-presenting PMA's 47th NMC. "Bloomberg is really privileged to take part in The Philippine Marketing Association's National Marketing Conference, " Vice President and Head of Channel Management for Cignal TV, Ms. Sienna Olaso shared. "It is our privilege to meet the people in the marketing industy, because our network's presence in the conference will definitely do something good for Bloomberg. By the same token, we hope that Bloomberg's integrity and credibility can lend itself to the success of the event. We are looking forward to meet everyone in the event and we are all excited in Bloomberg." Some of the speakers who are set to give their invaluable insights on the ASEAN market are, Philippine Airlines (PAL) veteran Jaime J. Bautista wjo has a long and credit-worthy record of professional service in the travel and tourism business. He recently assumed the presidency of PAL in October 2014 after the Lucio Tan took over management control of Asia'slongest-running airline. Asian Brand advocate Mr. Joe Baladi brings his extensive experience in business communications across multiple geographies to the conference with his talk on How Asian Brands can Conquer The World. This well-traveled marketing consultant is credited for shaping and repositioning major SME and MNC brands. He is a frequent speaker on the conference circuit, a regular guest on business television programs and regukarky contributes thought leadership articles to business magazines and newspapersacriss the region. As the CEO of BrandAsian, Joe divides his time in providing one-on-one business and branding advice and counsel to CEOs of some of the Asia's largest companies. Mr. Joseph "Chay" Cruel, currently the Vice President for Asia Brewery - Non -Alco Marketing, Business Development and International Business, is responsible for the popukar domestic non-alco productssuch as Cobra Energy Drink, Absolute Distilled Drinking Water, Summit Water, Sunkist, Nestea and Vitamilk. He spearheaded the international business and strategic partnerships for Asia Brewery. Ms. Angelica Suiza is the Chief Product and eCommerce Officer at Triple Pte. Ltd. With her expertise in omni-channel inventory resources optimization, she is responsible for providing category merchandising strategies for Under armour in Southeast Asia as aligned with the comoany's aggressive global merchandising directions. Mr. Lucien Dy Tioco is the Senior Vice President for Sales and Marketing at The Philippine STAR and concurrently heads the sales and marketing of the country's leading business newspaper, BusinessWorld. He oversees the sales and marketing programd of the Philippine STAR acrossall platforms : from print, digital, and most recently, television. His presentation will cover the overall strategic direction of media conglomerates, through his company's own Brand directions, as theyventure overseas. PMA hopes to focus the spotlight on the ASEAN region, which is seen as the 3rd largest consumer market after China and North America, but still overlooked by companies within the region. MNCs have been aware of this potential for some time as even Euromonitor acknowledges this region as one of the fastest growing markets in the 21st century. Through its theme " Hello ASEAN", the 47thNMC aims to shed light on these opportunities especially for those who are motivated by success and growth for their businesses.